CCSU B.Ed. Admission 2019: Chaudhary Charan Singh University (CCSU), Meerut is a public state university in Meerut, Uttar Pradesh (U.P. ).It is formerly known as Meerut University. CCSU, Meerut conducts entrance test for those students who want to take admission in various courses in CCSU. The Admission will be open for everyone who is interested and eligible. Every year thousands of applicants apply online for B.Ed. Entrance Exam. CCSU B.Ed. 2019 Application Form filling process was expected to start in the month of April 2019 but till now it is unavailable. CCSU B.Ed 2019 Exam Form will commence shortly on the portal. We will update you after getting the notification. The Application form was expected to be released in April, but till now it has not been released. We are providing a table here but it will be updated with the official notification. This schedule is based on last CCSU B.Ed exam. Note: The schedule will be updated when the official Notification or schedule will be released. CCSU BEd Application Form is expected to be available online by the month of April 2019. Those who want to pursue their career in teaching can apply for BEd courses. The CCSU B.Ed. Application Form 2019 will be published on the official website of Chaudhary Charan Singh University. Visit on official portal of University. Fill the personal details and upload scanned recent photograph, signature. Details should be filled correctly. Any wrong details will reject the application form. After completing Application Form 2019 filling process, it will proceed to payment page. Pay the application Fee through online mode using Cards or Net Banking. CCSU BEd Application Fee is categorized on the basis of reservation quota. For General/OBC fees will be Rs 500/- and Rs 250/- for SC/ ST candidates. Fill the CCSU B.Ed. 2019 Application Form before the last submission of the form. Candidate must check BEd eligibility criteria before appearing for CCSU BEd Exam. Those who are eligible can only apply for CCSU BEd Application Form. For General/ OBC Candidate, he/ she must graduate with minimum 50% marks from any recognized university. For SC/ ST Category, at least 45% marks should have in graduation from any recognized university. There is no age limit for CCS University BEd Exam 2019. The CCSU BEd 2019 Paper will consist 100 multiple choice questions related to GK, English, Hindi, Aptitude and Elective Subject. Each question carries 2 marks. Total marks will be 200. Time duration will be 3 hours to complete the entire question paper. The Syllabus contains topic from English, General Awareness, Aptitude, Hindi and one subject from Science, Commerce, Art & Agriculture according to candidate choice or interest. For more details check the official portal of CCSU, Meerut. Only a few days are left in CCSU B.Ed. Exam 2019. You can score well in the examination. Candidates can check previous year papers with solution in PDF form and also download it. CCSU B.Ed previous year paper will be helpful for everyone who wants to score good marks. Try to give the mock test to increase your speed. Check previous year sample paper to know the pattern, difficulty level of question paper. Make short notes on each topic and follow the concepts. Time is valuable. Don’t waste time on the useless discussion or unnecessarily topics. CCSU BEd Hall Ticket was expected to be published probably in the month of June 2019. Applicants can download CCSU B.Ed. Hall Ticket from whenever it will be available on Chaudhary Charan Singh University official portal. Go to the official website of CCSU, Meerut. 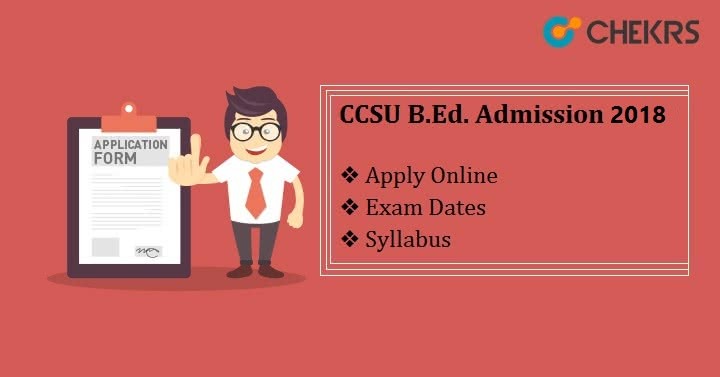 Click on the link to download CCSU BEd Admit Card 2019. Candidate must bring hall ticket during the examination, without admit card they will not be allowed to enter in exam hall. The authority of Chaudhary Charan Singh University, Meerut will release CCSU BEd Answer key 2019 within 10 days after conducting BEd 2019 Exam. Candidates can check B.Ed. 2019 Answer Key on the official website of CCSU, Meerut. CCS University has successfully conducted B.Ed 2019 Examination. A large Number of students has appeared for the exam this year and waiting for their result. University will upload result very soon. Candidates can check their results on the official website of Chaudhary Charan Singh University. We were expecting the result to be declared in the month of July 2019. CCSU B.Ed 2019 Score Card contains marks, rank, highest marks. CCSU 2019 B.Ed Cut-Off Marks will decide by the authority of CCS University. Those who appeared for CCSU B.Ed Exam 2019 and come under merit list can get admission in the college of their choice. The cut-off is decided on the basis of the number of candidates appeared in exam, previous year cut-off, the difficulty level of questions, highest marks.